The high school in Pinelands Regional School District is undergoing a roof replacement. The construction, which was contracted for completion on September first, is now more than eighty days behind schedule and is likely to continue into the new calendar year. 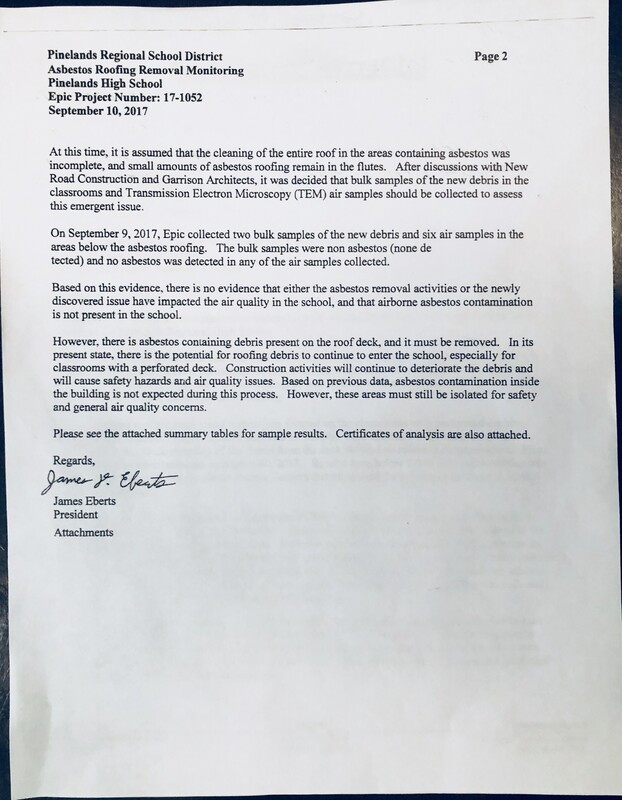 A September 10th letter by Epic Environmental is at the center of a seemingly never-ending controversy surrounding the project. 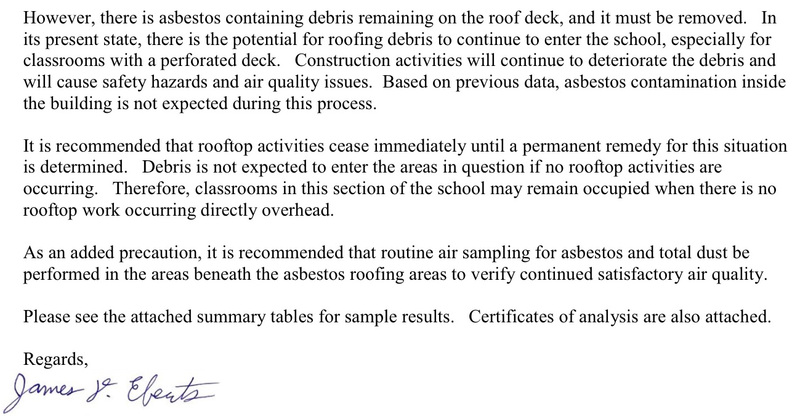 The letter urged district officials that “rooftop activities [should] cease immediately” due to air-quality concerns. The recommendation was ignored, and classes and construction resumed for three weeks. Parents did not discover this letter or the gravity of its contents until October 3rd. 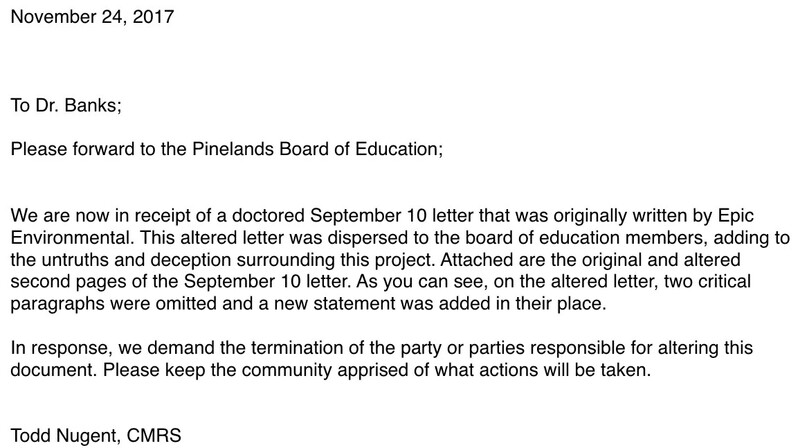 The majority of elected officials on the Board of Education learned about the letter only after parents posted about it on Facebook. Only three days ago, a scathing letter was sent to the Board by Todd Nugent, railing against the contractors for their negligence throughout the roofing project. Nugent is the father of two current high school students, an alumnus of the district, and the president of Synatech Inc., an environmental remediation firm. However these areas must still be isolated for safety and general air quality concerns. Beyond the deleted recommendations, there are two other significant differences between the original and altered versions: both pages of the original are printed on Epic stationery. Only page one in the altered version is printed on stationery. There is also a small formatting difference near the top of page two. Both versions, with all differences highlighted, are included in an appendix at the bottom of this article. Screenshots of the entire altered letter are also below. At the November 15th Board of Education meeting, a question-and-answer handout was distributed. 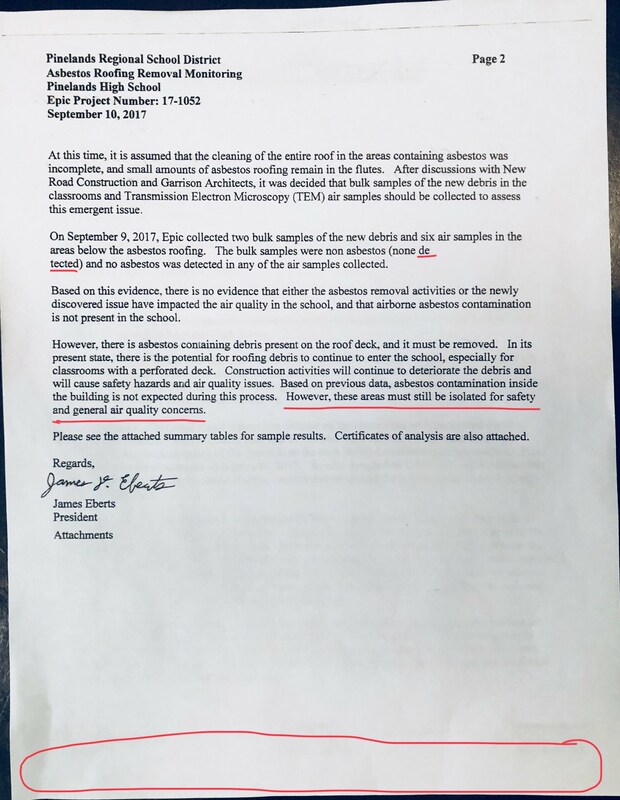 The information on this handout was gathered the day before during a construction meeting attended by three board members (members of the board’s “ad hoc construction committee”), Superintendent Maryann Banks, other district employees, and contractor representatives. Importantly, District Business Administrator Steve Brennan, a central figure throughout the project, did not attend the November 14th construction meeting. He was temporarily removed from his position on November 7th and then, surprisingly, reinstated at the board meeting on the 15th. We sent an email to all district employees that attended this meeting. We asked each for a statement regarding this altered letter and the experience of receiving it. We received a response from two. 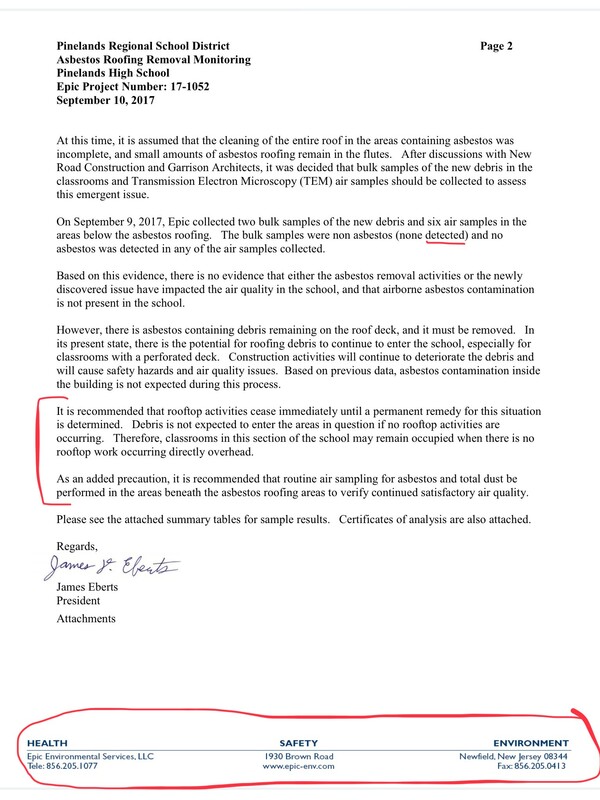 Susan Ernst, president of the Board of Education, and Thomas Williams, another board member, both confirmed that they received this letter and that it was altered in the manner as described above. They both also stated that the altered version came from New Road Construction’s Chuck Romanoli. Specifically, they both witnessed Mr. Romanoli pulling it out of his own folder or binder. New Road Construction is responsible for overseeing the entire project and for regularly communicating all progress and problems to the district. Mr. Williams further stated that, when pressed about these unexpected changes, Romanoli responded, “This is the letter that we have regarding September 10th.” Mrs. Ernst described some of those in attendance as being in “shock” at the obvious changes. She said that there was not much discussion about the alterations at the time. 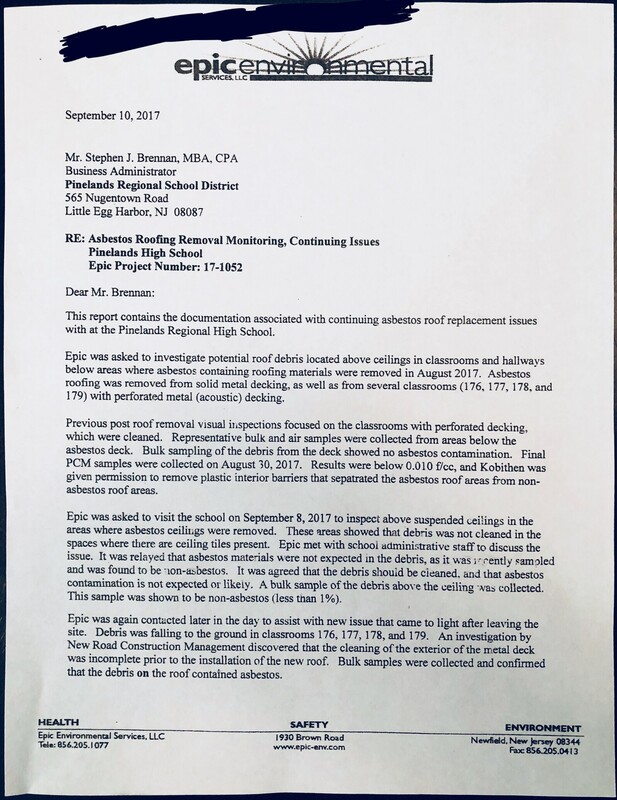 Both Ernst and Williams believe strongly that an independent investigation is necessary, both into this altered letter and into the entirety of the high school roofing construction project. We must be getting close to the truth. If key players are going to the extent of performing stunts to pretend that they did not receive the September 10th letter, I can think of no other explanation. The thought of [Romanoli] walking around with a draft for over two months is absurd. Or possibly an example of sheer ignorance that has caused the situation that we find ourselves in today. Citizens’ Media TV contacted both New Road Construction and Chuck Romanoli directly, twice before publication. We first described the subject matter in this article and offered the opportunity to make corrections or provide an on the record statement. We then sent a preview of the near-final article, again asking for comments and corrections. We have not yet received a reply. Citizens’ Media TV and Todd Nugent are collaborating on an upcoming article that will provide an in-depth look at asbestos mishandling at Pinelands Regional High School. Anyone with pictures, videos, or other information demonstrating the mishandling of asbestos, (or any health hazards), may submit it anonymously and confidentially to Nugent at PRHSasbestos@gmail.com. There are no differences on the first page.